UBAC2 antibody LS-C160369 is an unconjugated rabbit polyclonal antibody to UBAC2 from human and mouse. Validated for Flow and WB. Immunizing peptide used to generate LS-C160369. Useful for pre-absorption and neutralization of the antibody's antigen binding site. Western blot of UBAC2 Antibody in mouse cerebellum tissue lysates (35 ug/lane). 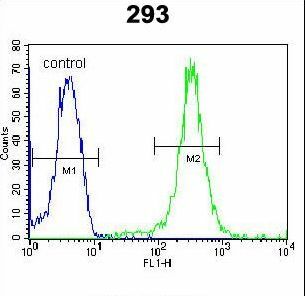 UBAC2 (arrow) was detected using the purified antibody. 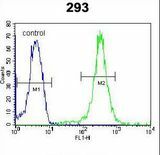 UBAC2 Antibody flow cytometry of 293 cells (right histogram) compared to a negative control cell (left histogram). FITC-conjugated goat-anti-rabbit secondary antibodies were used for the analysis.